that he must be paid. The men explained that they were penniless and could not pay. The doctor said he must be paid or he would undo the work. Laffin declared that they had no money. The doctor then leaned over the wounded leg, and with a pair of scissors, cut the stitches. Laffin's friends bandaged his leg as best they could and left the doctor's house. When the men reached the corner of South Centre and Williams Streets, Laffin's condition was most painful and with the consent of Mr. Ed Stanley, the men stopped at his house. Mr. A. H. Dowden heard of the affair and sent for Dr. Twigg, who came and sewed up the wound. The man was then removed to the Protestant Home and Infirmary, where his wound was properly attended to. Dr. Craigen said the men were well dressed, and he thought they were well able to pay for his service, and he felt he sometimes had to stop impositions on the county. 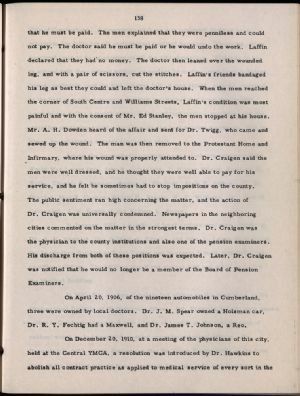 The public sentiment ran high concerning the matter, and the action of Dr. Craigen was universally condemned. Newspapers in the neighboring cities commented on the matter in the strongest terms. Dr. Craigen was the physician to the county institutions and also one of the pension examiners. His discharge from both of these positions was expected. Later, Dr. Craigen was notified that he would no longer be a member of the Board of Pension Examiners. On April 20, 1906, of the nineteen automobiles in Cumberland, three were owned by local doctors. Dr. J. M. Spear owned a Holsman car, Dr. R. Y. Fechtig had a Maxwell, and Dr. James T. Johnson, a Reo.